First on the block on March 10th was the exceptional ‘Golden’ Collection of Great Britain, presenting issues from the reigns of King George V to Queen Elizabeth II with shades and many rare varieties. This included a strong offering of Q.E.II errors that generated a range of gratifying results despite some items showing minor imperfections that sometimes prevented a higher realisation. Top price in the auction was the £12,138 paid for the 1998 Princess Diana 26p. imperforate strip of five with cylinder numbers (lot 578), this being one of just six recorded strips. 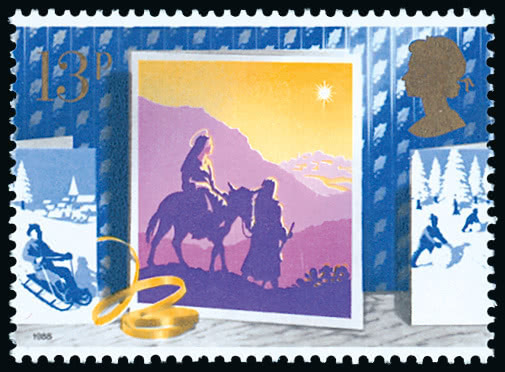 Only around ten mint examples of the 1988 Christmas 13p. 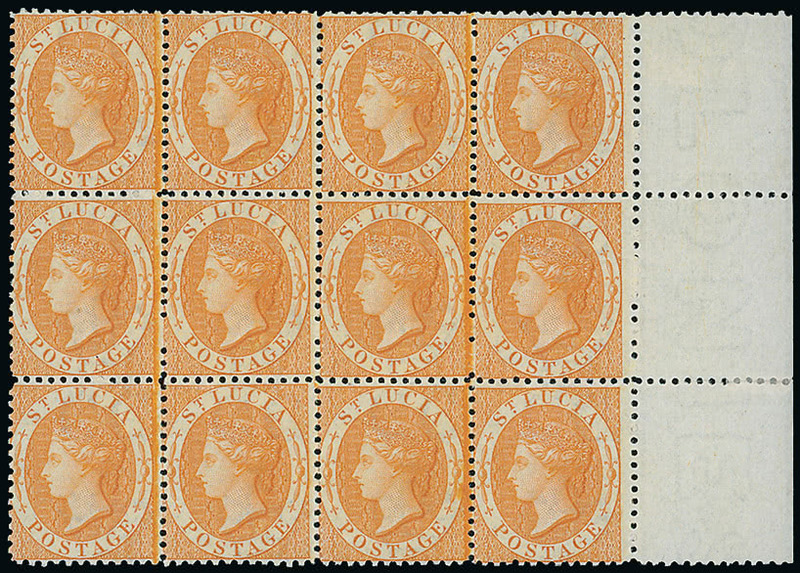 error of value (lot 539) are known, a level of rarity that fully justifies the £7,140 realisation. Issues from the reign of King George are usually solid performers and these lots again justified that reputation. A fine mint example of the 1924-26 watermark block cypher 1/2d. 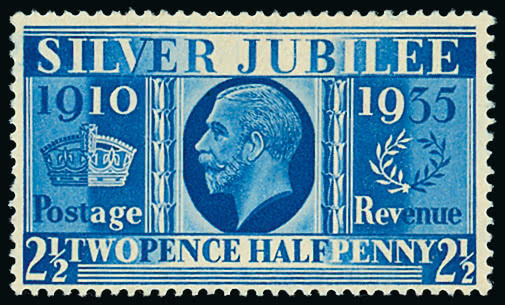 green doubly printed (lot 143, above), reached £6,754 against a pre-sale estimate of £2,500-£3,000, whilst the steady popularity of the 1935 Silver Jubilee 21/2d. Prussian blue (lot 197) was shown again by a realisation of £5,403, in spite of a gum thin and slight toning. The three-session auction of British Empire & Foreign Countries held on March 11th and 12th proved attractive to both collectors and dealers, the latter bidding strongly in a ‘Miscellaneous & Mixed Lots’ section that contained many lots where careful viewing was well worth the effort. Auction house methods of lotting evolve over the years to match demand and many covers and stamps, underappreciated today, may become the stars of the future if one has good instinct and a keen eye. If prices for collections were often the most dramatic, those for single items were intriguing if sometimes uneven. Prices worth noting include the unused vertical pair of the Ceylon 1885 10c. on 64c. red-brown imperforate between (lot 1731, left) that realised £3,930 (S.G. 174a, cat. £6,000). 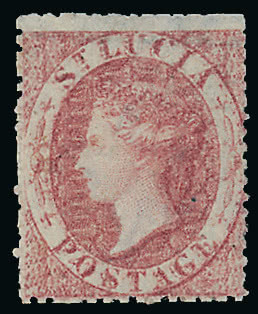 This rarity, one of just five existing examples, formerly featured in the Arthur Hind and Sir Ernest da Silva collections. The mint example of the British East Africa 1897 21/2a. on 1a. 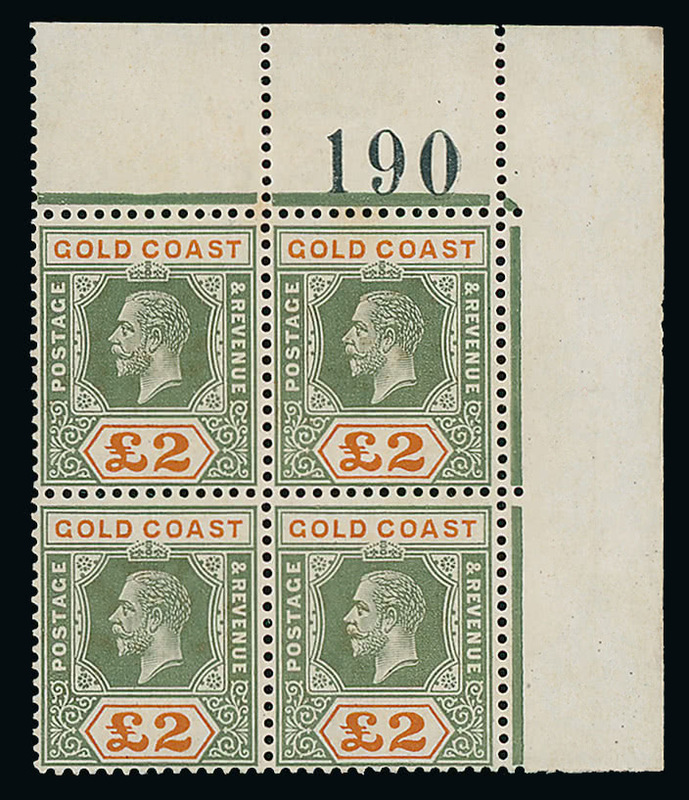 with overprint type 8 double (lot 2184) achieved £2,184. Only one mint and one used example of this variety are known and its catalogue value of £7,500 perhaps sells it short. Were Stanley Gibbons to increase catalogue prices for British Commonwealth countries with the same enthusiasm that they have those of Great Britain, collectors might bid more strongly with greater confidence in a growing market. Three important named collections featured in this sale. The ‘Trevol’ collection of Saint Lucia provided some notable results but the number of unsold lots among what might be called the more ‘straightforward’ material showed this to be one of those frustrating countries that cries out for a wider collecting public. Featured on the front cover of the sale catalogue, the beautiful mint marginal block of twelve of the 1864-76 (1s.) pale orange (S.G. 14c), believed to be the largest block extant (lot 2589), found a new home for £2,824. Having previously graced the Messenger, Molly and Filer collections, the attractive unused example of the 1860 (1d.) rose-red double impression variety (Lot 2546, left) rose to £1,965. The Robert De Keyser collection of King George V Key Plates contained much fine material once owned by Key Plate guru Peter Fernbank and, although prices for scarce plate number multiples and singles have shown strong rises in recent years, the relative realisations for selections from different countries again demonstrated that popularity out-trumps rarity. 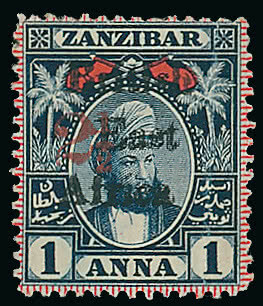 British African countries were in greatest demand, the study of issues from the Gold Coast (lot 1231, est. £2,000-£3,000) reaching £4,298 whilst the rare and attractive corner block of four of the 1921-24 £2 with sheet number (lot 1230) climbed well above its Gibbons catalogue value to £2,856. The Nick Rand collection of the 1935 Silver Jubilee Issue was well received with much bidding on the scarcer listed varieties, many of which deserve increases in their catalogue values. 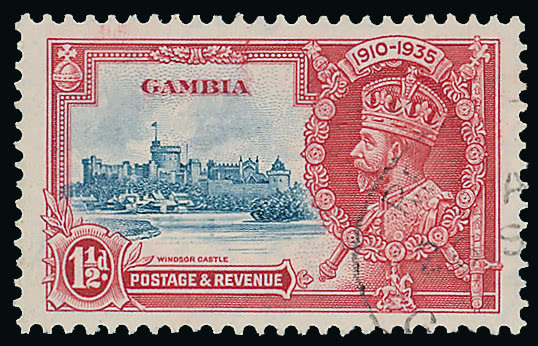 Fine used examples of the ‘extra flagstaff’ and ‘short extra flagstaff’ varieties on the Gambia 11/2d. sold together (lot 1303, left) for £657 (Gibbons cat. £850). Examples of the various varieties used on cover were particularly popular.